Recruitment processes differ from one organization to another. With Jobsoid, you can define your custom recruitment pipeline to suit your needs. You can add new stages, modify the existing ones or simply delete them. The default recruitment pipeline provided in your Jobsoid account will have the following stages - New, Screen, Interview, Offer, Hire, On Hold, Reject & Withdraw. You can customize the pipeline by changing the names of stages or adding new stages to the pipeline. 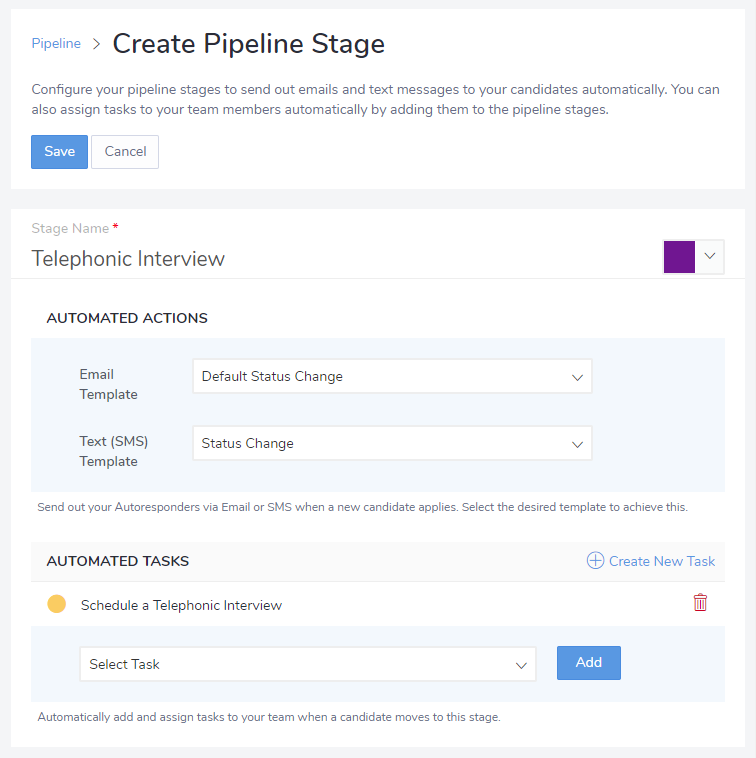 To simplify the process, Jobsoid allows adding of stages of type Screen, Interview and Offer to the pipeline. This can, however, be customized by contacting our support helpdesk. By default, Jobsoid allows you to add up to 5 stages under each category. This can be customized by contacting our support helpdesk. You can easily move the stages ahead in the pipeline by simply dragging them and changing the order. Note that you can reorder only those stages which belong to a particular stage category. For example, You cannot move a stage from Review Category into Interview Category. You can request customization of pipeline stages (adding categories in addition to the existing ones or adding more than 5 stages under each category) only if you have subscribed to a PREMIUM PLAN. You will need to send us a request stating what you would need to changed, or discuss your requirements with your dedicated Account Manager.